But I have to be honest that I'm super nervous about the flight right now. We are flying direct, and from the East Coast, so that means an 11-and-a-half-hour flight (!!). We are coming with iPads (DUH), lots of activity books, and a few new toys, but I'm stressed about my kids becoming bored (or hangry or worse) after just a few hours. If you have any good tips for long-haul flights with kids, please, PLEASE share them with me! But back to the fun stuff: With an impending vacation, the last few weeks have meant lots of shopping since the kids have outgrown most of their warm-weather stuff. And of course, even though I haven't outgrown my stuff, I still did a little shopping for me. 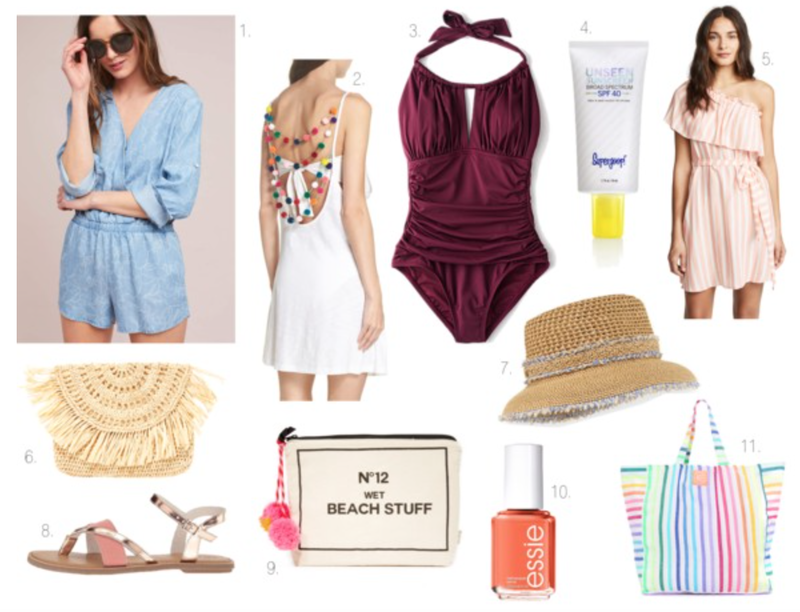 So, check out some of the fun new pieces I've bought (or will be scooping up soon ) for those essentials that I always pack on a beach vacation. 1. Cutest Romper - I saw this in the store and thought it looked amazing on the rack, but figured it would look horrible on me. (I'm not typically a romper person.) I kept walking...but kept thinking about it, so turned around and decided to give it a go. And, you guys, it is SO cute on. The shorts aren't too short at all (that was my big fear) and it's sooo comfortable (elastic waistband FTW!). Excited to wear this in Hawaii--and then at home all summer long. 2. Insta-Ready Cover-Up - I have had the same favorite cover-up for...way too long. I haven't retired it yet, but I wanted to add a new one into the rotation, too. This rainbow pom pom cover-up dress caught my eye immediately. It's just so happy and fun! 4. The Best Sunscreen - I've mentioned Supergoop Unseen Sunscreen SPF 40 as one of my favorites before, but it deserves another plug here. It looks and feels completely (yes, totally) invisible. I'm obsessed! 5. Pretty Little Dress - Well, this is a given, right? You need a bunch of great dresses for any warm-weather trip, and this Shoshanna dress is so feminine, breezy, and pretty, and would work for day or night. 6. Affordable Straw Clutch - I always bring one clutch on vacation with me, and always in a neutral shade so it goes with any outfit. I love this Mar Y Sol clutch, because the straw feels so beachy, and it's under $50. 7. Coolest Sun Hat - I've wanted an Eric Javits sun hat forever. They're very high quality, they're super chic, and they're squishable, so you can pack them in your suitcase without destroying them. Last week I actually bought this Squishee IV hat, which is the one I have wanted since I saw it on a friend. (It's hard to tell but the brim is slightly smaller than most, so you can totally wear it to walk around and not just for lounging by the pool.) And I love it! But then I saw this gorgeous straw bucket hat (which is giving me a Chanel-tweed vibe) and now I want it, too! 8. Metallic Sandals - I don't do heels on vacation. Period. So I always bring a great pair of flat metallic sandals, and then I can wear them out to dinner at night or even during the day, as well. These Toms rose-gold sandals are really cool and different--and they're just $59! 9. Bathing-suit bag - At every vacation's end, there's always the dilemma of what to do with your wet swimsuit. Eliminate the issue by packing one of these little waterproof bags. It's slim, takes up barely any space, and keeps the rest of the stuff in your suitcase from getting soggy. 10. Best New Pedicure Shade - I always get a pedicure right before vacation in either a dark shade or a bright, tropical one. I've been rocking dark all winter long, so I am really, really ready for something happy. This new coral (Essie At the Helm) is perfect. 11. Giant Rainbow Beach Bag - I've mentioned this Las Bayadas El Palo tote as one my my favorite things before because it's incredible. It's huge, but because it's made of a soft, thin fabric, it folds up completely tiny, taking up barely any room in your suitcase. Are you guys going anywhere for spring break? And have you been to Aulani? (Or gone anywhere on a long flight with kids?) Please give me all the tips! That will be a great Spring Break, and here I am still freezing in Jersey. BTW, I love the romper. How did I not know there was a Disney adventure in Hawaii?? I'm adding this to my bucket list! Enjoy your trip. Those metallic sandals are way too cute!! We are in Kauai right now! And it is POURING!! But so beautiful.